In collaboration with the Eames Office and Dutch designer Hella Jongerius, a carefully defined new color scheme was chosen to give the ESU a fresh and contemporary look while still celebrating the spirit of the 1940s and ’50s. The wider ESU Shelf, pictured above, is available in various heights, from a sideboard to a tall bookshelf. The ESU Bookcase is narrower; its four shelf levels correspond to the height of standard ring binders. Fitted with drawers and sliding doors, it provides a sleek look with ample storage space. Configure your ESU by Vitra today. 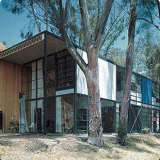 Eames Storage Units (ESU) exemplify Charles and Ray’s effort to design and produce economical household furniture using industrial production techniques. This system of lightweight, modular storage cabinets and desks is constructed of plywood, lacquered Masonite, and chrome-plated steel framing. The ESU has many of the same convenient features as the Eames-Saarinen Organic Design Case Goods created in 1941 for the Museum of Modern Art’s Organic Design in Home Furnishings competition: The standardized parts of the ESU are entirely interchangeable; they can be stacked and can serve as room dividers; and they can be easily adapted to a variety of office uses or residential storage needs in living rooms, dining rooms, and bedrooms. Charles and Ray made no attempts to disguise or soften the off-the-shelf look of the ESU components. Their industrial antecedents are quite apparent. Herman Miller began marketing the Eames Storage Units in 1950, and the original production continued until 1955. In the final three years of that production run, they also produced a version with steel rod legs. Herman Miller and Vitra resumed production of the Eames Storage Units and Eames Desk Units in the 1990s. They are still manufactured by those two companies today. The new Eames storage units make use of an ingenious and inventive system of construction as simple and as openly engineered as a bridge. The elements come together with a fine unforced logic and the methods and mechanics and reasons are completely apparent in the whole. The units have been designed in such a way as to permit exceptional economies in fabrication, and it was with a practiced foreknowledge of possible complications that the designer was able to avoid the unnecessary and to use the simplest approach to the industrial techniques available. The combination of standard elements can be made to serve an infinite number of uses—in the living room, the dining room, the bedroom, or as a room divider. Color is used with great flexibility—calm and clean—in feeling with accents of brilliant blue, red, yellow, against a background of neutral colors and natural birch and walnut. Eames, Charles. “A New Series of Storage Units Designed by Charles Eames,” Arts and Architecture 67, No. 50 (April 1950) 34-35.